Like many countries in Latin America, Brazil has had some success in reducing poverty and inequality over the last two decades – in contrast to the global trend of widening gaps between rich and poor, which has become a growing concern since the financial crisis. The world is waking up to the corrosive effects of inequality, not only on society, but also as a drag on further economic growth. Brazil’s progress on inequality came, however, from a very low base. The income gap between the country’s top and bottom decile remains about five times as wide as in advanced economies. Brazil must still do much more to ensure that its GDP growth translates into broad-based improvement in living standards. But what policy areas most need attention? 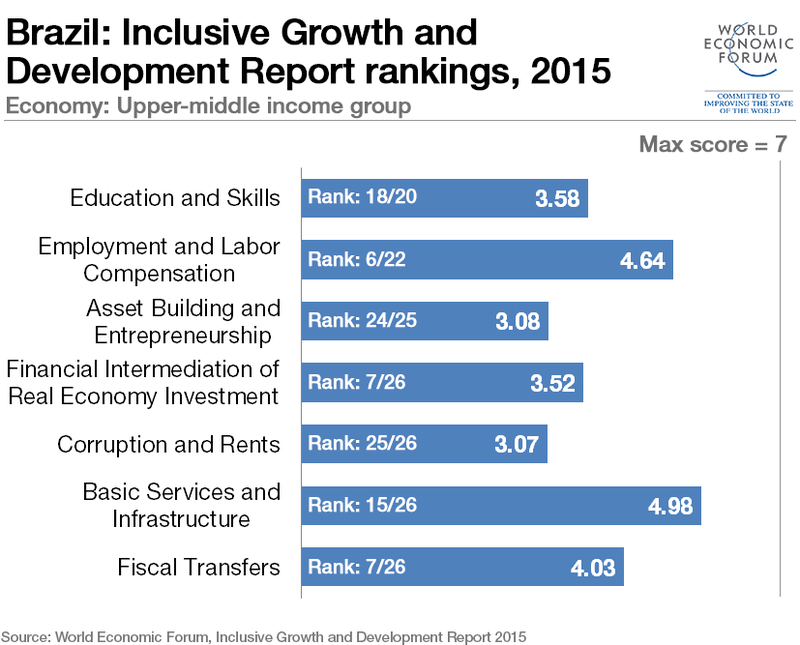 The World Economic Forum recently published the Inclusive Economic Growth and Development Report 2015, identifying the structural and institutional features of economies that equip them to grow in a socially inclusive way. Research into inclusive growth is still nascent, so the report does not attempt an overall ranking of countries. Rather, it divides them into groups based on income levels, and ranks countries in these groups according to seven principal policy domains and 15 sub-domains that are deemed critical to fostering inclusive growth. The aim is to enable meaningful comparisons of strengths and weaknesses among countries at broadly similar stages of development. Among Brazil’s strengths is the inclusiveness of its financial system, ranked best out of the 26 countries classified as upper-middle-income: Brazil’s entrepreneurs have relatively little difficulty in accessing resources to develop their businesses compared to peers. The country also scores comparatively well overall on a range of indicators related to the labour market; registered unemployment, for example, is lower than in many other countries. According to one estimate, changes in the distribution of wages and paid employment in Brazil accounted for 72% of its reduction in inequality between 2001 and 2012, pointing to the importance of labour market policies in making economic growth more inclusive. However, the country’s businesses struggle with red tape: it takes more time to start a business, enforce a contract, deal with routine tax-related paperwork or resolve an insolvency than in almost all comparator countries, and and informality is perceived to be an issue. As many people derive much of their income from small business ownership or self-employment, an encouraging climate for starting and running enterprises is seen as important to foster inclusive growth. Brazil is perceived to lack a culture of enterprise, defined as the propensity to view entrepreneurial failure as a learning experience rather than an embarrassment; among upper-middle income countries in this regard, only Croatia and Bulgaria rate lower. Reforms to Brazil’s education system should be a major priority if high inequality is to be further reduced. Only three of Brazil’s upper-middle income country peers rank lower on perceptions of the quality of education – yet only three spend a higher proportion of their GDP on education, suggesting that the system currently delivers poor value for money. In particular, the education system is failing children from less-wealthy families; the disparities in reading and math scores between children from the top and bottom income quintiles are larger than in most countries at similar income levels. Likewise, Brazil scores relatively poorly on a measure of how many students from socio-economically disadvantaged backgrounds manage to become top performers at school. One of the fundamental goals of a public education system is to minimize the extent to which inequality of wealth becomes inequality of opportunity in the next generation; Brazil’s education system is failing in this task. The picture is similarly discouraging on the quality of health services – only Venezuela, among upper-middle-income peers, scores worse; and overall infrastructure, including energy, transport and communications, it ranks 24 out of 26. Decent healthcare and basic infrastructure are considered to be prerequisites for connecting individuals to markets and thereby translate GDP growth into widespread increases in living standards. One area where Brazil is doing well is social protection, with relatively high scores for the adequacy of social assistance and social insurance programmes. The country’s development of cash transfer programmes, in particular, could explain a high score on perceptions of government effectiveness in tackling poverty and inequality. Before fiscal transfers, Brazil is the 23rd most unequal of the 26 upper-middle income countries; after fiscal transfers, it improves to 18th. Yet there is scope here, too, for greater value for money. On one measure of social programmes’ benefit-to-cost ratio, Brazil scores lower than most comparator countries; and on general perceptions of wastefulness of government spending, only – again – Venezuela and Argentina save it from bottom position. Brazil must do more to tackle corruption as indicated by its relatively low performance in public trust in politicians, diversion of public funds and irregular payments in tax collection. Corruption entrenches existing power relationships and its impacts are felt mostly by ordinary citizens, making it a severe impediment to an economy’s capacity to grow inclusively. Alongside education, infrastructure and excessive bureaucracy, it needs to figure highly on Brazil’s policy agenda for inclusive development and growth. The Inclusive Growth and Development Report 2015 is available here. You can also explore the findings of the report using the heatmap below.